Extreame Savings! 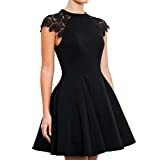 Up to 46% off on Dresses at Envy This Stuff. Top brands include Yidarton, ACEVOG, Anne Klein, BCBGeneration, Lark & Ro, Runcati, MISSKY, Calvin Klein, Maggy London, SUNNOW, REMASIKO, Vince Camuto, Gabby Skye, PattyBoutik, Amoretu, HUHOT, HEO CLOTHING, PARTY LADY, & Drimmaks. Hurry! Limited time offers. Offers valid only while supplies last.